3. The function of CTE-25AD produced by TAC is special, it can make separate action such punching, pressing bending, entering and returning oil. 4. Enclosed 2m hose. And can order to extened to 10m. 1. Low pressure 200 cuin/min@ 0-200PSI. 2. High pressure 20 cuin/min @ 200-10000PSI. 3. 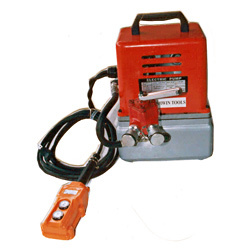 Voltage 110V-220V/50-60HZ accessory: with 2m hose which can be increased length. 4. Use R-32 special circle oil or SHELL T-46 ，ISO-SVG-46. 6. Oil per minute(cc): low 2.6L high 0.32L.